Syrian Ceasefire: A Signal that Russia is winning the War? Whether or not the cessation of hostilities in Syria holds, it is a major turning point in the revolution and civil war that began in 2011. As of Saturday morning in Syria, the major fronts between the regime and the Muslim Brotherhood factions were quiet. There continued to be some fighting between the Syrian Arab Army of dictator Bashar al-Assad and al-Qaeda in the north of Latakia, and between government forces and Daesh (ISIS, ISIL) southeast of Aleppo. Those two groups were excluded by Russia and Syria from the ceasefire, and they themselves denounced it, so fighting with them will continue. Likewise, the besieged towns of Madaya and Zabadani, where the regime has starved out civilians as well as militants, will continue to be attacked, according to Damascus, because a significant portion of their armed guerrillas are Syrian al-Qaeda (the Nusra Front). a. to cut the capital of Damascus off from resupply by cutting the route from the port of Latakia to the southern, inland seat of government by taking Homs. But Homs has been decisively retaken by the regime and rebel groups to its north have been pushed back. b. to take the province of Latakia, including the port, by moving west from militant-controlled Idlib province. But Latakia has been completely retaken by the regime except for some northern pockets, and it is al-Qaeda strongholds in Idlib that are in danger now. c. To take all of Aleppo, the largest city, in the north, thus reducing the regime to holding only a southern rump city and isolating it in preparation for capture. But regime-held west Aleppo, cut off last October, has been rescued and supply lines for the most part restored. 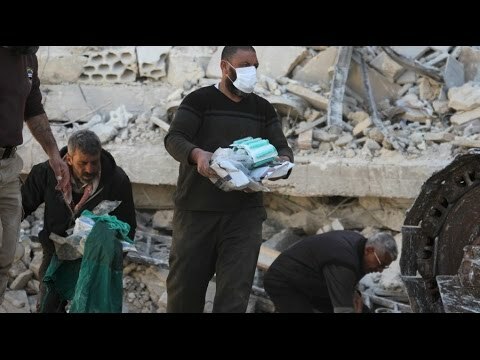 It is rebel-held east Aleppo that was in danger of falling before the ceasefire. Now, at most, the de facto division of the city will be prolonged. But there seems little chance of a rebel takeover of the whole enchilada. 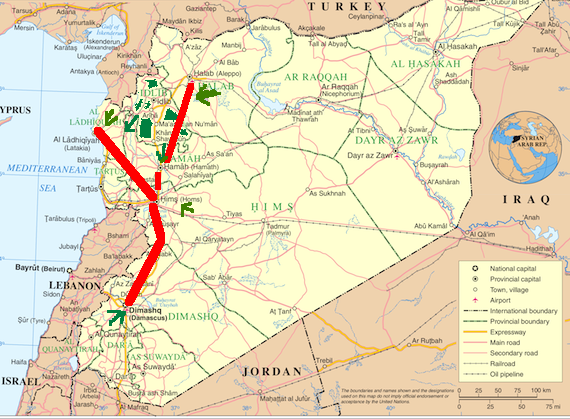 d. For the rebels, both al-Qaeda and Muslim Brotherhood, to move up from Deraa in the south to the capital and take it directly (this was the strategy Churchill tried at Gallipoli, of going straight for the Ottoman capital during WW I, via the shortest landing-point). But the regime has pushed the rebels south from the capital in recent weeks and on Friday took Deraa al-Balad 56 miles south of the capital. All four pathways to a successful revolution have now been closed off. Unless things change radically on the battlefield, there is no longer any prospect any time soon of a rebel victory. The implications of this situation are that the regime has survived and the rebels are on the ropes. This configuration could change in the future, but for now, the insurgency is on the ropes. Moreover, if the mainly Muslim Brotherhood remnants of the Free Syrian Army maintain the ceasefire with the regime, then they are freeing up Syrian Arab Army troops to fight al-Qaeda and Daesh. In essence, Putin has managed to divide the opposition into those willing to observe a cessation of hostilities and those who are not, or from whom Russia would not accept such an offer. If the less radical Free Syria Army factions around Homs, Hama and in west Aleppo maintain the ceasefire, they are essentially entering into negotiations with the regime. From there, the step to participating in new elections is not a very large one. Russia has shown a credible interest in coopting them, and it might now be able to do so in some instances. This eventuality would make it actually not necessary for the SAA and Russia to defeat the less radical rebels, a real savings in military resources. If the remaining fighting to be done in Syria is against al-Qaeda and Daesh, then Russia has a great diplomatic victory and is essentially on the same side as NATO. The West can hardly complain about Russia doing in those two organizations, even if the US has been de factor allying with the allies of al-Qaeda until now. The revived Syrian Arab Army and its Iranian, Iraqi and Hizbullah allies can certainly take Raqqa and polish off Daesh in Syria if they don’t have to worry about Free Syrian Army units attacking Homs or the outskirts of Damascus. If Daesh falls, Russia will get a lot of the credit for it in places like France, which Daesh attacked twice last year in horrible acts of terrorism. The cessation of hostilities is fragile and could easily fall apart. But it was already more successful Saturday morning than was earlier thought likely. That it is happening at all freezes the board at a point where Russia and the regime hold most of the cards. It could be the beginning of the end of the war.